my folks just bought me a new mg50dfx 50w for christmas (yes i know im not supposed to know) best part is that we got it for $240 locally. If you are just playing metal, they work great! yea that is a nice head but i needed the portability of the combo amp. i just cant deal with having a huge stack around. i imagine ill upgrade someday to a nice jcm900, or maybe a stack when i have my own place. of course that'll be sometime in college. i'm actually more into the "grunge" heavy rock sound. this little amp does a decent job for now, and when in doubt: effects pedals!! 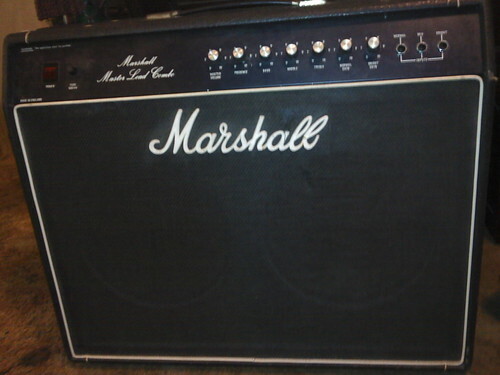 Today I got a Marshall AVT 150 combo with a marshall 4x12 extension speaker with celestions. Still need to find the right clean tone but I am super happy with it so far! i recently purchased a 1960A 4x12 cab with 75W Celestions. I paired it up with a JCM2000 DSL 100W. This amp is so loud it peels the paint off my walls. I love the clean channel, I love the ultra-gain channel. Great, versatile amp. I'll probably pick-up a JCM900 combo at some point as well. I tried the 50w MA combo out a few days ago, figured I'd just pop this here as I couldn't find a dedicated thread. Decent clean channel, but any high gain sounds on the distortion channel sounded pretty awful- no amount of EQing could dial out the fizz and harshness, even with the treble OFF and mid rolled back. I kinda wonder if it was faulty or had a duff valve as the demos I've heard didn't sound too bad at all. Either way- try before you buy. It's an awesome amp. It's been my baby for 9 years. The cleans are some of the best on a Marshall...almost Fender. The dirt channel is warm distorted Marshall goodness. The reverb is not that wonderful, but it keeps the tone from being flat. I use a EHX Holy Stain for Room/Hall reverb. The beauty of this amp (besides the sound) is the simplicity. Just enough features to keep the veteran or the rookie satisfied. The other guitarist in Aerosmith used to have one. It comes in either a 2x10 or 1x12 speaker configuration. I have the 1x12. It takes pedals really well and has an FX loop, but I just run my pedalboard straight into the the front. They also made matching extension cabs and I would love one day to find one for mine. JTM 60 2 independent footswitchable channels, each with their own EQ, a spring reverb with dual controls (one for each channel) and a series FX loop and a parallel FX loop. How quiet can this thing get with the Master Volume? I've never seen one, but I am trying to find a "bedroom volume" amp that I can still get some overdriven tone out of. Think "an overdriven Epi Valve Jr 5-watter is too loud" bedroom volume. The JTM45 reissue I have played was way, way, way too loud for my uses. Does the emulated speaker out mean I could use some studio headphones with it? Yep, I know this first hand. Our apartment building cited me for noise from the Epi Valve Junior, so I sold it. If we get in trouble for noise again, we can get evicted by some process in the lease. Having sweet tube overdrive tonez wasn't worth losing our awesome apartment. Never mind that I can hear other people's stereos playing terrible music at all hours of the night..
what you want is a bugera v5. This is the perfect bedroom amp. Adjustable for 5W to 1W to .1W, tube driven, takes pedals well, good reverb, and has a Headphone jack. I got one on ebay for $90. I sold it once I got my Silverface Musicmaster Bass amp. This is a 30 Watt Marshall amp with a 12" speaker, so it is loud as hell. I usually can't get above 4 with the master volume. That said, with the emulated output, you can turn down the Master to 0 and run it into some kind of input device that uses headphones. I run the XLR plug out the back of the amp into my old Digidesign MBox2, which I can run headphones out. I use it for quiet practicing or recording demos. I finally got my gear worked out and recorded some demos today using Garageband and Photobooth on my Macbook Pro. Will upload in about an hour if you want to hear. Sorry for the newbie questions, I've never had a Marshall with master volume. I would love to hear some demos. The majority of Youtube vids have terrible audio. I'd imagine you need to leave the speaker plugged in. Actually, you can leave the amp in standby mode while you record or turn the volume to 0. Speakers stay plugged in. The output is an xlr connection, so you must have a recording unit that matches up to take advantage of it. My amp is no longer made (1994-1997) so check eBay or CL. I've had one of these cheap, small tube combos: the Epi Valve Jr.
Dunno how much quieter the .1 watt mode is, since my intuition says it is only slightly quieter a 5 watt amp. (Around half as loud as a 5 watt amp?) I guess I just need a really nice head that has a headphone out that mutes the speakers altogether. I don't want to go the cheap route just because they're low wattage rather than because they have a good tone. Posted: Wed Mar 02, 2011 9:23 pm Post subject: Marshall JTM 60 dies for 3-4 sec? well if you get too quiet you wont be pushing the speaker enough to get any kind of full sound. "half as loud" is a quite a big difference though. that's like the difference between a 5 watt and 50 watt amp. which is quite large. .5 watt would be half the volume of a 5 watt. so .1 watt would be even less than that, something like 60% less volume. I guess I just need a really nice head that has a headphone out that mutes the speakers altogether. I don't want to go the cheap route just because they're low wattage rather than because they have a good tone. the headphone out on the bugera is a line-out with speaker simulation. I think it really is one of the best options out there for home practice/recording.